Met Center fans never got tired of watching this guy's post goal celebration, known to himself and fans as the "Goldy shuffle". Bill Goldsworthy was unquestionably the first big North Star talent as well as one of the league's emerging stars of the expansion era. In his first season with Minnesota he led all NHL scorers in points in the 1967 playoffs. He later became the first player to record 200 goals with a post '67 team. He scored a club record of 48 goals in 1973-74 season that stood for eight years before Dino Ciccerilli broke the mark. He was elected to play in five All-Star games. 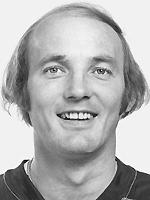 He captained the Stars from 1974 to 1976. He could play at both ends of the ice and unlike some stars of his day, Bill was known as a solid team player. It was this very quality that helped him to be selected on Team Canada's Summit Series team that defeated the Russians in 1972. As much ability as Bill possessed some say that he could of been even better. Most of his best years were spent on talent depleted squads with little or no depth. His off ice struggle with alcoholism was a suspect contributor as well. On February 15th, 1992 Bill's number eight was retired in a memorable ceremony in front of a sell out crowd at Met Center. Two years later he was diagnosed with Aids. On May 29th, 1996, at the age of 51, Bill passed away. He died only a few miles from the grounds where he entertained hockey audiences so well.